As hyped up as everyone is about the OnePlus 2, the fact that the device will be coming with the Snadragon 810 on board has left a lot of us feeling a tad bit uncertain about its future. After all, the Snapdragon 810 has seen its fair share of controversy over the past couple of months, and any device choosing Qualcomm’s flagship SoC will also have similar questions raised about its performance. But we’ve been assured from OnePlus that its latest flagship won’t suffer any overheating problems, as it has been modified to minimize any such problems that might occur. Well, according to folks over at GizmoChina, the OnePlus 2 might not be that different when it comes to performance from its predecessor. An alleged set of benchmarks have been posted by the website that compare both the OnePlus One and the OnePlus 2. 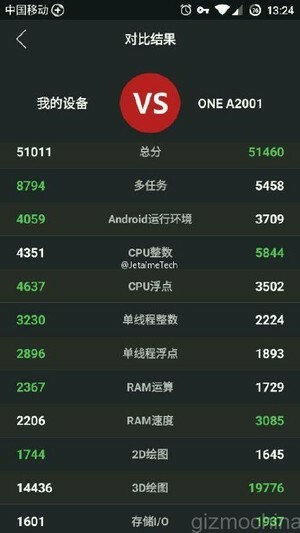 As can be seen in the image above, when it comes to Antutu scores, the device differ by less than 500 points, even though the OnePlus One comes with the much older Snapdragon 801 on board. Such a low score could mean only a few things. Either, OnePlus has failed to accommodate the Snapdragon 810’s throttling issues, despite claims that measures such as an additional thermal coating and software optimizations have been taken. We’ve seen the Snapdragon 810 v2.1 get scores as high as 60,000 on the Xiaomi’s Mi Note Pro (According to company benchmarks) so perhaps the processor isn’t quite ready yet. The company could also be testing the Snapdragon 810, which could result in under clocking the processor, which might also be the case on the final device, which is due in a week from now. We’ll find out soon enough, that’s for sure. Stay tuned for more and let us know what you think in the comments section below.